Much has changed since GVEC’s initial years as an electricity provider to South Central Texas, as is revealed in these two photos. 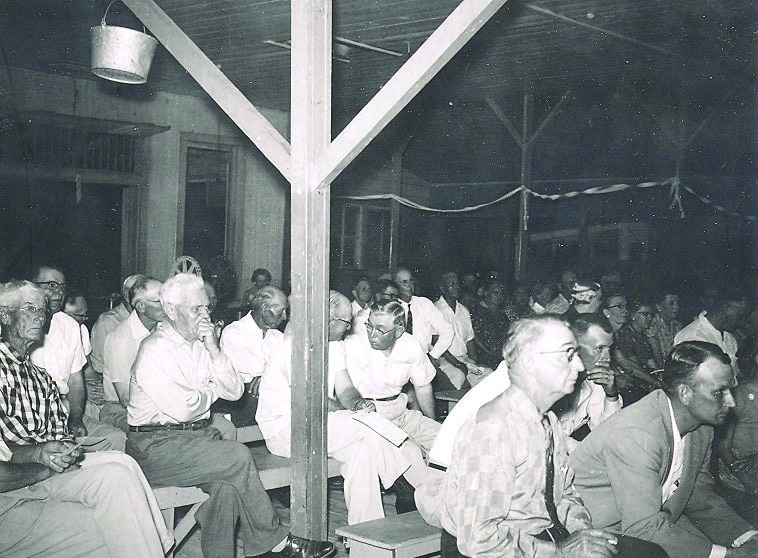 Above, some of the Cooperative’s earliest members and leaders participate in one of GVEC’s initial public meetings. Below, current and longtime GVEC Board President Lewis Borgfeld greets members during a public gathering of the membership. 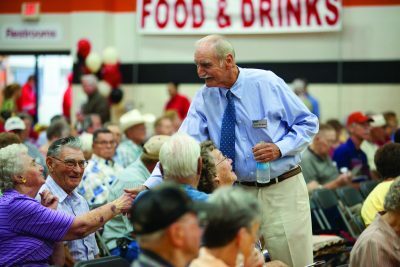 Gonzales, Texas–December 3, 2018 – From darkness to light, from rotary-phones to dialup internet, from SmartHub to SunHub Community Solar to data at the speed of light and electrified sunlight, the Guadalupe Valley Electric Cooperative (GVEC) has reached the milestone of 80 years of service. On Dec. 2, 1938, at a meeting in Cost, Texas, a group of farmers from around the Guadalupe Valley signed GVEC’s Articles of Incorporation. In the years to follow, the Cooperative would turn on the lights for rural families throughout the region, putting all the modern conveniences of electrification within reach. In the process, GVEC formed close ties to the communities and people it served, creating a mutual, close-knit relationship of modernization, success and growth. In 2018, GVEC’s relationships are stronger than ever, Thompson added, and continue to inspire the Cooperative to branch beyond its roots as an electricity provider. Through its GVEC Home business, for example, the Cooperative now offers AC/heating sales and services, Solar sales and services, and Electrician services—all of which are critical to an efficient and comfortable home. The Cooperative has grown geographically, too, currently encompassing 3,500 square miles of service territory and serving over 80,000 consumers residing in 13 South Central Texas Counties. The Cooperative’s internet service represents another expanded option intended to benefit local communities. Starting with dial-up access in 1998, GVEC.net has since expanded to offer wireless internet access and, more recently, fiber access. General Manager Darren Schauer has characterized GVEC Fiber Internet as not merely a “game changer,” but as a “life changer”—a product that will help transform daily life for the thousands of local residents and businesses who use it. GVEC is a progressive cooperative specializing in the delivery of products and services that empower the people and communities in the Guadalupe Valley. Offering dependable electricity, high-speed Internet, reliable AC/Heating sales and service, solar options, as well as electrician services, GVEC serves over 90,000 consumers through five customer service locations in Cuero, Gonzales, La Vernia, Schertz, and Seguin.